You are here: Home / CFL/League / Classy Thelwell calls it a career after 10 CFL seasons. Classy Thelwell calls it a career after 10 CFL seasons. 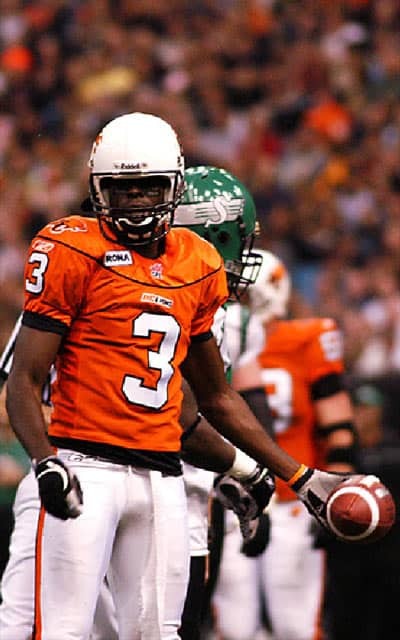 The CFL has lost one of it’s best Canadian receivers of the last 10 years, as former BC Lions and current Calgary Stampeder Ryan Thelwell announced his retirement today. Thelwell played most of his career with the BC Lions and won a Grey Cup with the team in 2006. The native of Montego Bay, Jamaica moved to London, Ontario at the age of 4 and played college football at the University of Minnesota. Thelwell was drafted by the San Fransisco 49er’s in the 7th round of the 1998 NFL draft. The NFL’s loss was the CFL’s gain, ad Thelwell became “Mr. Automatic” for the BC Lions and their fans. Thelwell was a division all-star in 2004 and 2005 and became known for his great catch and run move that he used to get key first down at big times in a game. After the 2006 championship season with the Lions, Thelwell left as a free agent to become a member of the Calgary Stampeders, where he won a second title in 2008 with the Stampeders. In 2009 Thelwell suffered an achilles injury which he battled back from to play one last year in 2010. “It has been an honour to be a part of the Canadian Football League and to have had the opportunity to represent two great organizations,” said Thelwell. “I never would have dreamt that professional football would’ve had such an impact on my life, but it has allowed me to develop friendships that will remain with me for the rest of my life. I really want to say thank you to everyone who helped me along this journey.” Thewell said. Thelwell’s infectious smile and classy nature made him a fan favourite on and off the field and a popular teammate in both BC and Calgary. On behalf of Lions and CFL fans everywhere, we thank Ryan for his years of service to the league and wish him all the best in the next phase of his life.